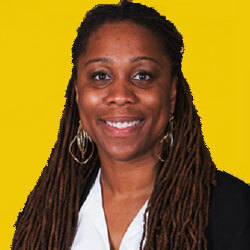 Following the success of a recent visit by a men’s college basketball coach to recruit local players in Bermuda, leading to two scholarship offers, Wolfpack Hoops’ coach Iesha Gray [pictured], a Head Coach at Division 2 Wilberforce University in Ohio, will be coming to Bermuda from December 18 to the 20. The visit to the island will include a skills clinic with local girls basketball and netball players, while recruiting to look for potential scholarship athletes. Only the first 40 girls to register will be accepted to attend the clinics, which are being provided for free by Wolfpack Hoops. Coach Gray said, “Wilberforce University athletic department’s mission is to provide an atmosphere conducive to sustaining personal, academic, and athletic excellence. We emphasize personal, spiritual and academic development as priorities while the student-athlete is also challenged to commit to excellence within their sport. Charles Peters, Director of Wolfpack Hoops, said, “Wolfpack has made a commitment to helping players achieve their goals both on and off the court and we consider this another step. We have now been working with the top women’s basketball players in Bermuda for over a year and we have seen a rapid development in their skill levels. “I believe that Bermuda could become a leader in the development of women’s basketball. We have all the ingredients for success here. “Coach Gray has expressed to me an interest in developing a pipeline of athletes from Bermuda who could receive scholarships in the near future in multiple sports. This affiliation between Wolfpack and Wilberforce University makes sense for Bermuda on many levels. “We have also partnered with Coach Bullet Basketball and coaches from the Bermuda Netball Association to make sure that this opportunity reaches as many girls as possible. This is another historic first for Wolfpack Hoops where we have challenged the mindset that athletes must leave Bermuda in order to succeed at reaching their goals. Coach Tim Trott said, “I’m not totally aware of the number of women who have played college ball overseas. My initial guess would be that the majority of them were not recruited. Most, probably tried out for their respective teams as walk-ons. “The only person I recall who played Division 1 basketball back in the 80′s is Carol Ann Jackson who actually went to Clemson for track and ended up playing women’s basketball as well. She was a phenomenal athlete who played against the men when she returned home from school back in the days of the Pembroke Youth Center on Angle Street. “However to my knowledge Kim Robinson was the first Bermudian woman to receive a Division 1 scholarship specifically for basketball at Cal [University of California-Berkeley] in the early 90s. The first 40 players that wish to attend the Coach Gray clinics must register online. For more information on Coach Bullet Basketball’s development programs for girls, local basketball official certification, and basketball event administration, contact Coach Bullet at coachbullet32@gmail.com. For more information about Wolfpack Elit, contact Coach Peters at charles@wolfpackhoops.com. Nice to see our young ladies having the opportunity to show their talent in hope of a scholarship. Im surprised that a US university offers Netball scholarships as I didn’t know Netball was a NCAA sport. This sounds like a fantastic event for Bermuda’s young ladies. Good luck to all. Let’s go ladies show them what you got. An opportunity for a free education. That’s just grand. Good luck to these ladies and great work by these coaches.